Diabetes and potassium share a close relationship. Potassium is needed to assist with insulin secretion and therefore, blood sugar regulation. It's also closely linked to heart health. Below we share the facts about potassium and diabetes. 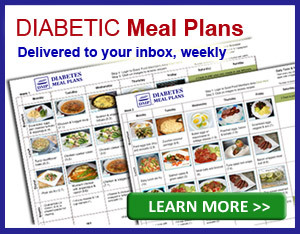 Why it's so important and how you can ensure you get enough in your diabetes diet. Potassium is an essential mineral found in a variety of foods. Potassium is also an electrolyte, which regulates the fluid balance in your cells. Other minerals that help with fluid balance are sodium, calcium, and magnesium. Fluid balance is related to blood pressure, and some people may know that consuming a diet high in potassium can help lower blood pressure levels. Beyond keeping your blood pressure in check, potassium is also known for helping your heart pump. It also helps your muscles contract and is required for your nervous system to send nerve signals to other nerves. 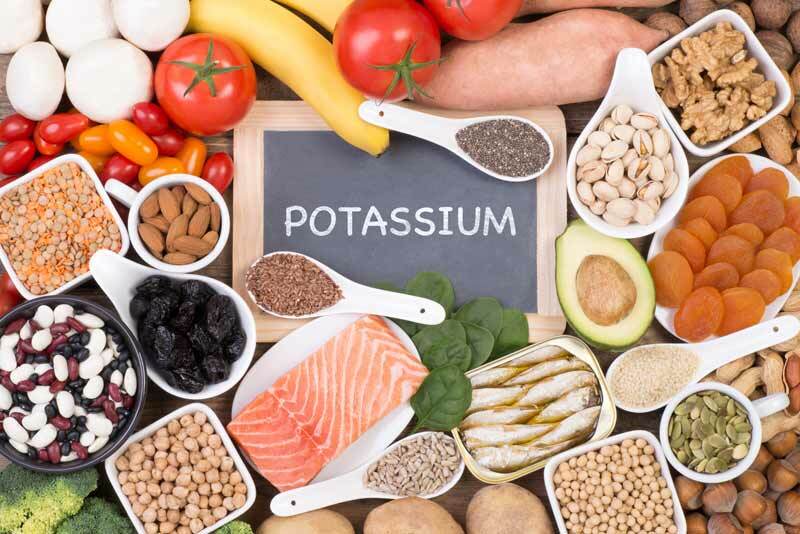 And if all that didn’t convince you that potassium is important, then keep reading to learn how potassium is directly connected to your diabetes and prediabetes. How is Potassium Connected to Diabetes? Within each of your cells are many tiny openings (channels) called ATP-Sensitive Potassium Channels. These potassium channels open and close at specific times; potassium is only able to travel into or out of your cell when they are open. The potassium-channels act as one of the first steps for insulin release. When potassium channels are open, insulin secretion (release) is suppressed. Once your cells have sufficient levels of potassium, the channels close and insulin is released from the cells of your pancreas. Chronically high blood sugar levels increases your risk of low potassium levels due to increased urinary excretion (high blood sugar levels cause you to urinate more). Diabetic Ketoacidosis (DKA), while more common in type 1 diabetes, is a dangerous condition of extreme high blood sugar that requires hospitalization. A very common feature of DKA is low potassium. Interestingly, research demonstrates people with diabetes often have normal or even elevated potassium blood levels. While this might seem counterintuitive, your body is incredibly complex and it will pull potassium from storage. But then you lack stored potassium which can become problematic over time. The big picture is potassium and diabetes are closely related! In fact, there was a study that showed babies who were given genes with faulty potassium channels all ended up with (type 1) diabetes. INSIGHTS: Potassium is involved in insulin release. High blood sugar may cause low potassium. For reference, normal potassium levels are between 3.5 mEq/L and 5.0 mEq/L. Researchers have concluded low potassium blood levels are a risk factor for diabetes. For example, one study followed 12,209 participants for nine years. Those with lower potassium levels were nearly 1.5 times more likely to develop diabetes, compared to those with higher (but still within normal range) levels of potassium. Another study followed 4,409 men and found low blood potassium levels to be predictive of type 2 diabetes, in otherwise healthy men. It has been proven that African Americans are at increased risk of developing diabetes, and some research has connected this increased risk to potassium levels. In fact, a 2011 observational study found potassium levels to be lower in African Americans compared to caucasians at baseline. African Americans with potassium levels less than 4.0 mEq/L were 2.28 times more likely to develop diabetes compared to those with normal levels. Some researcher have proposed that a type of blood pressure (diuretics) medication called Thiazides may increase risk of diabetes due to the fact that Thiazides lower potassium levels. This study found that each 0.5 mEq/L decrease in potassium increased risk of developing Thiazide-induced diabetes by 45%. Researchers noted Thiazide-induced diabetes typically occurred within the first year of starting Thiazide treatment. Beyond prevention, another study found 40 mEq of potassium effective at stabilizing, and in some cases improving, blood sugar levels in people with prediabetes. After 3 months, blood sugar levels were lowered by 1.1 mg/dL (o.1 mmol/L) in the potassium group, but not the placebo group. Numerous studies have confirmed potassium plays a role in maintaining blood pressure. For example, a 2015 meta-analysis found potassium supplementation can lower blood pressure by as much as 6.8 mmHg. A similar conclusion was drawn in a meta-analysis of 19 studies – that potassium supplementation lowers both systolic (top number) and diastolic (bottom number) blood pressure. Longer supplementation duration was associated with more profound improvements. Researchers also emphasize that lowering sodium intake (ie. cutting out processed foods) helps to improve one’s potassium-to-sodium ratio, which is crucial for blood pressure control. One novel feature of the DASH diet is increased potassium intake via increased vegetable and fruit intake. Researchers have shown following a DASH diet can lower systolic blood pressure by 5.2 mmHg and diastolic blood pressure by 2.6 mmHg, as well as positively impact total cholesterol and LDL levels. 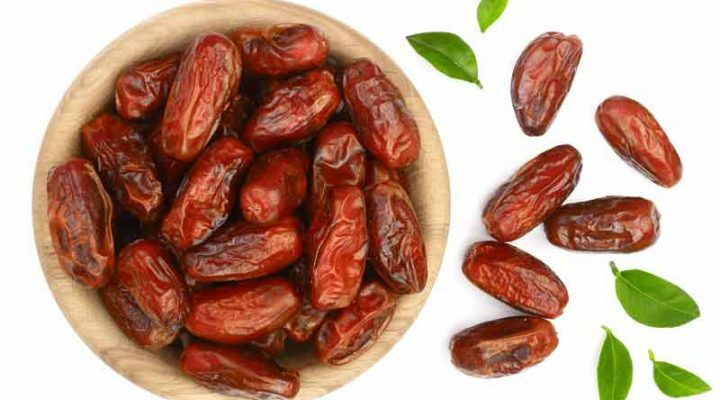 Observational studies have shown that higher intake of potassium could help prevent cardiovascular disease and even delay renal issues in people with diabetes. Please pin, tweet or share, then keep reading – thanks! The recommended intake for potassium is 4,700 mg per day – those with kidney disease may be prescribed a different recommendation which we will discuss below. NOTE: If you are only mildly hypokalemic, you may not notice any of the symptoms. NOTE: Kidney disease is the most common cause of hyperkalemia. Most routine lab work includes checking a potassium level and you should always speak with your doctor if you are concerned your potassium level is off. When given a choice, always try to consume your nutrition from real, whole food sources. When supplementing you run the risk of unintentionally taking too much potassium and this has the potential to slow your heart beat too much. Furthermore, you body is more adapt to processing naturally-occurring potassium, compared to vitamins and minerals that have been synthesized in a plant. If you feel you may benefit from potassium supplementation, you need to check with your doctor for specific recommendations about dosage. The most common form of potassium supplements is potassium chloride. In general, we used to eat A LOT more potassium in our diets. With the increasing popularity of processed foods people are finding it harder to meet their potassium requirements. Plus, eating a lot of processed foods increases your sodium (salt) intake, which disturbs your potassium-to-sodium ratio. 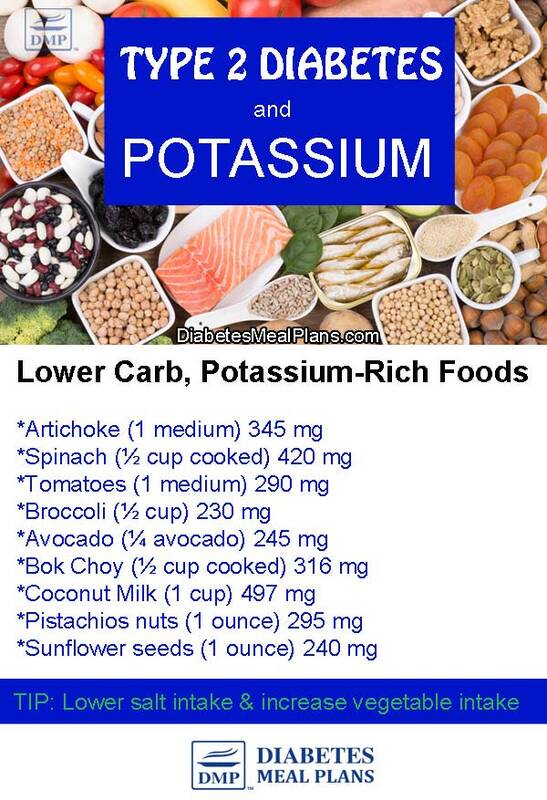 Luckily, potassium is abundant in many low carb, blood sugar friendly foods that you are already eating! Often, when we think about potassium-rich foods people talk about bananas and potatoes. Both are very high in carbohydrate and for that reason we do not encourage you to consume bananas or potatoes. As you start decreasing your processed food intake, and begin increasing your vegetable intake you will find you have no problem meeting your recommended potassium intake. And, as an added bonus, you will most likely find that your blood sugar levels improve with this shift as well! TIP: Eating a healthy diet filled with an abundance of vegetables and other whole foods will provide plenty of potassium. Those with kidney disease may need to adjust their potassium intake. Potassium is typically filtered through your kidneys, but if your kidneys are not functioning at full capacity then you are at risk of developing severly high levels of potassium. Especially in the case of CKD, high potassium can lead to dangerous heart rhythm problems and even cardiac arrest. Some people find it very difficult to manage both CKD and diabetes. If you have CKD you need to work closely with a dietitian or health professional to determine the appropriate amount of potassium for your body. In some instances, you may be instructed to keep your potassium intake closer to 2000 mg per day. 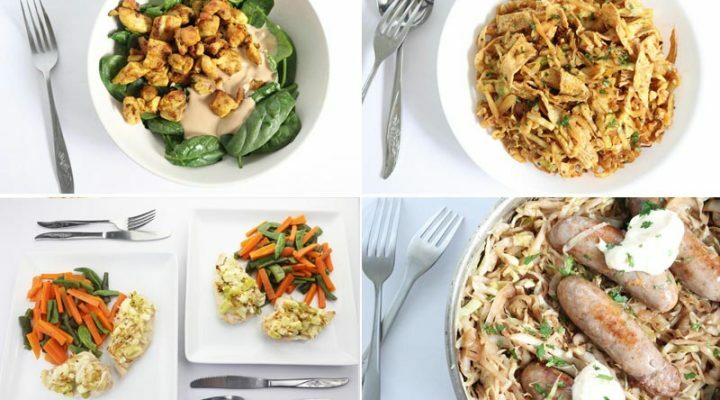 The following list includes a few examples of low carbohydrate vegetables that are relatively low in potassium, and may be better choices for those people living with both diabetes and CKD. Potassium is intricately related to diabetes through pathways related to insulin secretion. Potassium balance can be disrupted due to many factors including poor blood sugar control, taking diuretics (blood pressure), or the presence of chronic kidney disease. Supplementation is not usually necessary, and in some instances may lead to hyperkalemia, which can be quite dangerous. By consuming a variety of whole, unprocessed vegetables such as spinach, broccoli, and avocados you are going to consume adequate potassium, as well as many other beneficial nutrients to help improve your blood sugar and help you feel your best! 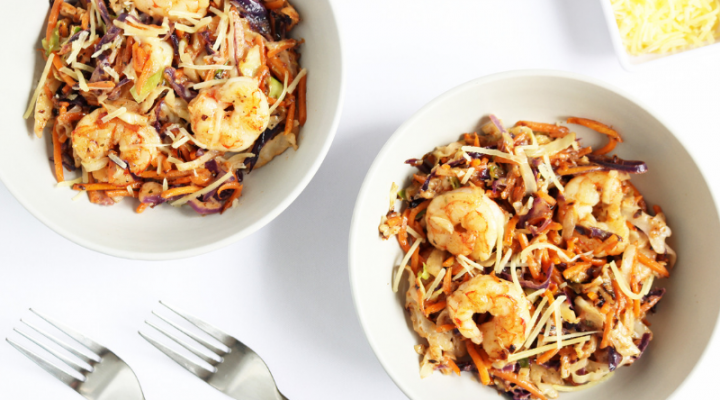 Need help consuming a potassium-rich, blood sugar friendly diet? Consider Joining Us As A Member. Glad you are finding the information useful! Let us know if you ever have any questions. Luckily the same diet, a low carb diet, can likely help you achieve all of those goals. Our recommendations are based on tons of research that we are constantly reviewing in order to stay up to date. You can read a little more about a low carb diet over here, and get started with a food list on this page.